Europe market is predicted to surpass an annual installation of 20 GW by 2024. Cost efficiency, low carbon emission when compared to conventional energy sources and competitive generation tariffs are few imperative parameters influencing the technological adoption. 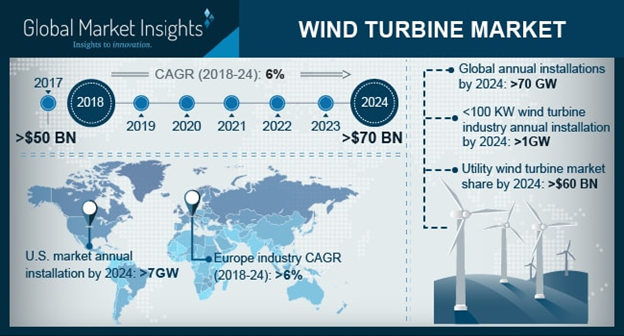 The off-grid wind turbine market is anticipated to grow pertaining to operative & economic feasibility in distant areas in comparison to the grid connected power networks. Governmental schemes pertaining to the rural electrification program coupled with growing adoption of microgrid power networks will further enhance the business growth.